TVA | Mainline Conveyor Systems, Inc.
Mainline’s Transfer Vehicles are driven by multiple geared brakemotors, mounted to individual axle/wheel sets. All of the vehicle’s drive motors are speed controlled by means of a common variable frequency drive unit. The structure of the base vehicle along with the unique ” pivoting dual center drive” allows more controlled wheel/floor contact than any previously marketed designs. These features, in combination with the multiaxle drive system provides improved vehicle drive, as well as improved braking capacity in emergency situations. The standard vehicle supports two powered conveyors for the purposes of retrieving and dispatching loads from adjacent fixed conveyors. Mainline’s center drive “BDLR” is used as the vehicle’s conveyor and provides primary belt drive to all rollers. In addition, Mainline introduces laterally movable conveyors that allow separate positioning of the conveyors for car travel and load pick-up functions. 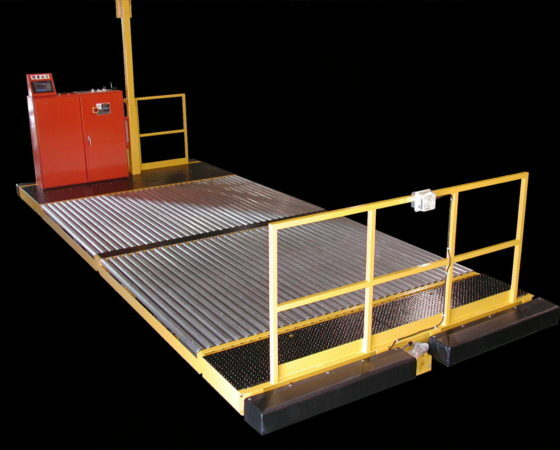 This feature provides closer approach to the stationary conveyors during load transfer, while allowing additional clearance with fixed conveyors during car travel.